Simon Wells knows something about making good animated movies. He was, afterall, one of the helmers of the beautiful The Prince of Egypt. So it’s all the more a shame that he couldn’t see the flaws in his Mars Needs Moms, which he co-wrote with wife Wendy Wells (her first feature film) as well as directed. Called a family film, Mars Needs Moms is more a kids movie (although, our test 10-year-old shrugged when asked if he’d want to watch it again, which is kidspeak for nah). The film is based on the picture book of the same name by Bloom County cartoonist Berkeley Breathed , and it falls into the same trap as Zathura and other full-length filma adaptations of a 32-page books — thin story. The premise is simple enough: Martians kidnap a mom (voiced by Joan Cusack, Toy Story 3) and her son (Seth Green, Austin Powers movies) stows away in the ship, goes up to Mars and tries to save her. Part of the problem is, the story asks a lot of its viewers. For one, we have to believe that the Martians, who live on Mars, can’t breathe the Martian air. Hmm, really? And then there’s the plot point that the adult Gribble (voiced by Dan Fogler, Take Me Home Tonight) has been living on Mars, hidden from the Martians, since he was an 8-year-old stowaway on the ship that stole his mom 25 years ago — all by himself. Okay, sure … or maybe not. Another part of the problem is, the story has no real emotional drive. Yes, Green’s Milo wants to save his mom, but the real feeling in the story comes from Gribble, who’s a supporting character and not the one we’re following. And the whole question of why the Martians are kidnapping moms, which is solved in the movie, but in an unsatisfying and very unoriginal way. And then there’s the motion-capture-heavy animation a la The Polar Express, which is even more creepy in this film. Yeah, no surprise that the movie bombed at the theater (it even ran producer Robert Zemeckis’ planned motion-capture remake Yellow Submarine off the rails). 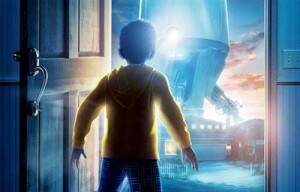 One postive aspect is that Mars Needs Moms does look good in its high-definition presentention on Blu-ray. The colorful graffiti of the alien Ki (Elisabeth Harnois, TV’s Miami Medical) looks all the more stunning, and the sound is great, with a nice reverberation from the speakers on the spaceship launches. The Blu-ray has some nice extras that kids will enjoy, including the “Life On Mars” feature, showing the raw motion-capture footage of full scenes. Our test 10-year-old thought this was pretty cool. The long list of deleted scenes and an expanded opening, with introductions from Simon Wells, aren’t anything special except some good segments that show more of how Gribble survived on Mars as a child. Rounding out the pack are the featurettes “Fun With Seth,” showing the comedic actor hamming it up on the set, and “Martian 101,” which explains how Martian voice actors Harnois and Mindy Sterling, as well as others, developed a Martian language for the film. Maybe it would have been better in subtitles … or maybe not.